The 2008 American Buffalo Gold Uncirculated Four-Coin Set on Monday joined the quickening ranks of other bullion coins and is no longer available. The collector proof and uncirculated coin series has been getting extra attention from collectors after the U.S. Mint reduced prices and announced it would eliminate many collector coins from its numismatic portfolio, including all the American Buffalo uncirculated coins and all but the 1 ounce proof option. The latest U.S. Mint sales figures indicate 5,796 of the sets had been sold, with an increase of 8.7 percent from the previous week. Also sold out in the Buffalo series are the uncirculated 1/4 and 1/10 ounce coins as well as the proof 1 ounce, 1/10 and 4-coin set. In similar news but regarding its non collector coins, the U.S. Mint told authorized dealers last Monday that its investor bullion coins were depleted, and that the American Eagle one-once silver and gold coins were the only remaining 2008-dated bullion products it had left. 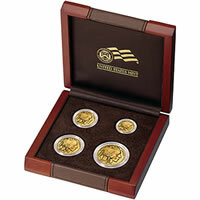 It also said limited quantities of blanks could delay some 2009-dated bullion coins. The CoinNews collector tool page U.S. Mint Collector Bullion Coin Prices, Premiums and Sales Figures has been updated.